The Jimi Hendrix Experience played the Woburn Festival in England on 6 July 1968. The band had returned to the UK after a long stint cracking the US after the Monterey appearance in 1967. Although the set was fairly short - there were a number of bands playing - it mixed hits with new tracks that would appear later. 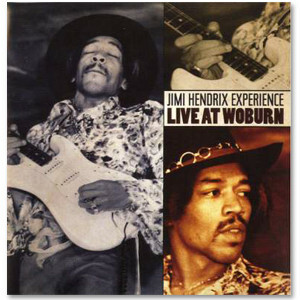 This is a "warts and all" live recording released by Experience Hendrix as an Official Bootleg. It should be noted that the sound is not as perfect as would be expected from a live album today but the CD is all the better for it. Too often live albums are ruined by adding overdubs later to hide any mistakes on the day. This effectively removes the live elements of the album. A live gig includes faulty equipment, missed notes, forgotten words or guitars going out of tune. In this case the amplifiers being used for the first time since returning from Spain are not functioning correctly. Jimi and bass player Noel Redding are clearly unhappy with their equipment. However, the buzzing and cutting-out amps make this recording far more real. The opening track, Sergeant Pepper's Lonely Hearts Club Band, is present only in part and with a sound quality far inferior to the remainder of the CD. Apparently, someone forgot to press the button to start the recording! The final track played on the night, Wild Thing, is not present at all on the CD. However, the other six tracks are present and correct and in full sound quality. This includes the buzzing of the amplifiers! This is the Jimi Hendrix Experience at their height. They didn't play much in the UK during 1968 having spent considerable time in the US. Although most tracks came from Are You Experienced, there is also the inclusion of a track from the forthcoming LP Electric Ladyland as well as the instrumental Tax Free that did not make the record. There are no tracks from the current LP, Axis Bold as Love. One intriguing point about the Experience is that songs always sound different and they feel as if they are being improvised on the spot. This is particularly evident on Voodoo Child (Slight Return). Even though the studio version is yet to be released, the band are already stretching out and expanding what would become a Hendrix classic. The band also stretch out on the hit single Purple Haze. This starts with a wealth of feedback and improvisation prior to settling into the well-known riff. Another real treat is a splendid version of Red House. Hendrix was a great blues player and the Experience show they can play the purer blues as well as the heavier tracks. The CD is accompanied by a notes booklet which contains interesting information about the Woburn Festival, one of the first music festivals in the UK. This is a great read.